Infinitely functional, professionally casual, the Avenger IV can be toted as a laptop backpack or briefcase. Multi-tasking and expandable carry case converts to a backpack for easy sprinting through airports and train stations. Kiva's B-4 is perfect for casual or business travel, combining the compact profile of a carry on with the flexibility of a garment bag. Kiva's signature top hinge opening, singles this duffle out as something special. A lightweight tote with multiple sized pockets adjustable carry handles and backpack conversion. The ease of wheeled travel with the convenience of backpack carrying, all in a manageable size, makes this pack a smart choice. The double roll bar and horizontal as well as verticle packing capability help insure that clothes arrive wrinkle free. Removable suiter, extension panel, locking telescoping handle and inline skate wheels, still meet carry-on regulations. This handy waistpack is stream-lined to hide neatly and securely under travel clothes. The bottom expands to add three dimensional capacity. Extremely light weight adventure pack, 30 litres, 950g. It piggy backs on your rolling luggage, features signature top hinge opening internal, external pockets and a removable pouch. The slim folding vertical design keeps your personal travel essentials, documents, travel cards, etc. close at hand. The slim folding horizontal design keeps your travel essentials close at hand. This multi-functional wallet keeps oversized currency and your passport safe and secure. 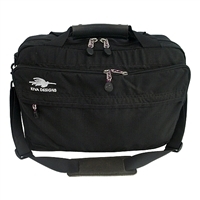 Lightweight nylon duffle bag folds neatly into compact pouch or worn around the waist. The Pico Pico Key Chain Duffle 24 litre nylon duffle bag folds into a tiny 11.5 x 6cm key clip pouch. Lightweight nylon tote folds neatly into compact pouch or worn around the waist. A giant 89 litres of packing space on sturdy inline skate wheels. A full featured garment bag without the cumbersome size. It zips shut all the way around making it a sleek and compact alternative to traditional bulky garment carriers. Spacious laptop sleeve, fully padded front & back sections with organizer pockets, expandable back section, side haul leather wrapped handles or felt lined shoulder pad strap. Multiple pockets and pouches offer safe haven to your inventory of personal items. This small format wallet has two zippered pockets, hook and loop closure to keep your currency, credit cards and ID safe and secure. A great all around courier bag when organization is essential. Carry all of your travel documents clearly visible and easily accessible in this compact organizer. The little 'watch-dog' of a shoulder bag is organized beyond belief. Just check out these features!